Russet Street Reno: 100th post! Well, I know that some bloggers will do a '100 Things About Me' post, however I know most people probably don't want to read a list of 100 things, so I'm going to drop a zero and make this a '10 Things About Me' post. I also cannot help but share a bunch of old pictures. On second thought, let's just make this a '10 Photos of Me' post, shall we? My house can't have all the fun! 1. For years I dyed my hair red, and it was amazing. The monthly dye jobs were just too much for me to maintain, even though my awesome mom did it for me. Thanks, mom! 2. I also tried out a brown before the red, which was more fun than blondes may think. 3. I have an OCD-like bedtime ritual that includes putting on hand lotion, and then trying to put on my lip balm. It has to be in that order, and it's always impossible to open that stupid lip balm after lotioning, but I just can't change the order. Weird, huh? 4. I owned a house before Russet St, and I look back and wonder why I didn't paint the hell out of those kitchen cabinets. And the valance? Oy. 5. 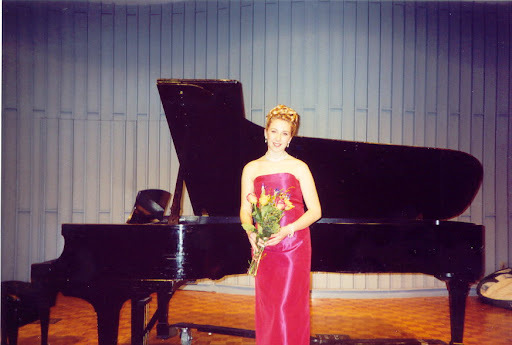 I have a Bachelor of Arts degree in Vocal Performance, but I haven't sung in years. 6. 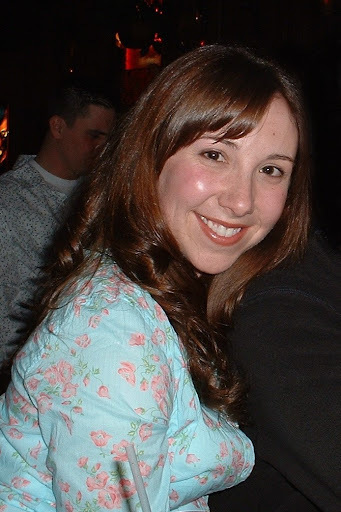 I was a promotional 'shot girl' for 5 years. Then I became too old to tolerate being nice to strangers in bars for money. I also, uh, 'grew out of' my little outfits. Dang metabolism. 7. I cannot eat one bowl of cereal, I always refill it at least halfway. Which may be why the Special K diet doesn't work for me. 8. I was an amateur racecar driver! Thank you so much for being my reader, and for encouraging me to continue this far! Here's to 100 more posts! I loved this post, so, so great to read more about you! 1. I love the red hair. 2. I think I already told you my hubs was a vocal performance major. 3. I love your blog. Love your blog and your writing style :) Keep on posting! Yay! I love the KiSS Photo I laughed out loud. What an awesome hair color on you, red! Cute post. Thanks for sharing!! the red totally looked natural -- i would have never guessed! and you totally got me with your race car driver pump fake. i was all, "no way -- so cool..."
and then i scrolled down. i'm so gullible. Congrats on your 100th post! I'm enjoying your blog - it's nice to read fellow house bloggers - and you're nearly my neighbor too! I'm only at 18 posts so far, but I'll get there... Thanks for the inspiration. Congratulations on your 100th post. I'm with you on the cereal, who eats just one bowl anyway (much less the serving size)? P.S. I started my blog the month before yours and Im' on my 37th post~I'm such a slacker! Thanks for sharing a little about yourself. I laughed at the cereal comment. Why don't we just give ourselves one big bowl...I think it's a mind game. So funny. Kristi - yes, I had naturally curly hair, but after I went back to blonde after the red (over a year ago now) most of my curl went away. I have no idea why and it's the most depressing thing. So I straighten it more now. Maybe it will come back someday? hahahah I love the last picture- that look on his face is priceless. What a fun post! You look great in every hair color! Love your blog (and your style)! 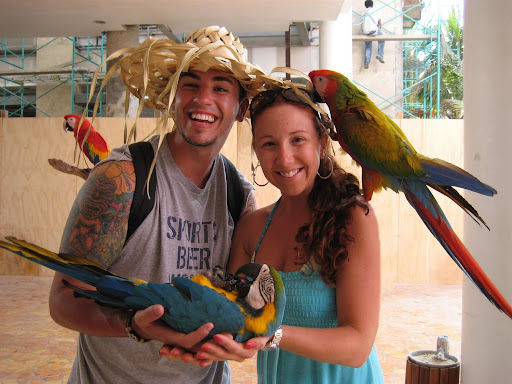 I enjoyed reading these little tidbits about you - it's always fun to learn more about the blogger behind the blog. :) The different hair colors almost made you look like two different people! Congrats on your 100th post and a great blog! These are all so fun! The KISS costume rocks! 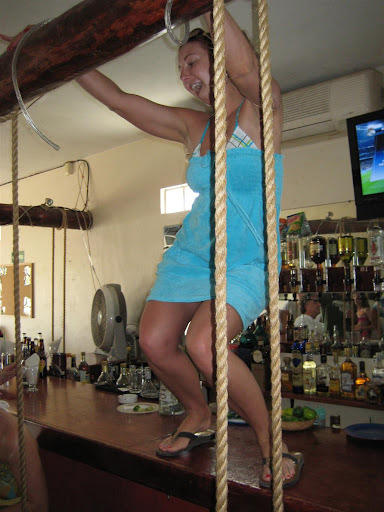 You haven't lived until you've danced on a bar - good for you! P.S. I love that you were a Captain Morgan shot girl (my fave liquor). Keep up the great work I love reading your posts! The best "random things about me" post I have ever read! The KISS costumes are awesome!! Congrats on 100 posts! Congrats on 100 posts. I agree with Micah...this is my favorite random things about me post. I feel like I "know" you more now:). HA! My girlfriends and I were going to be KISS for Halloween this year, but then I got tix to the FL/GA game last minute and had to bail. 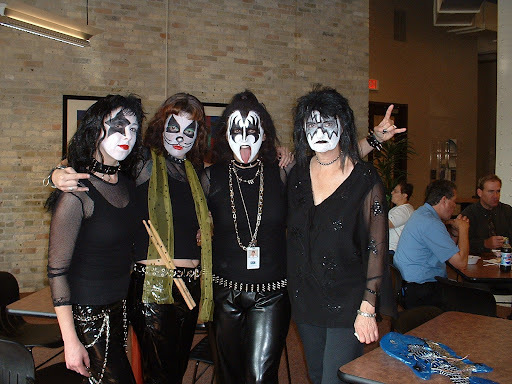 They found another girl to be Gene Simmons and won a few hundred bucks in a costume contest. Fantastic! I want to reprise this year, because I was so bummed I didn't get to participate! Love it! Awesome list! I was actually a flute performance major...it's fun to find other crazy music majors living outside the music world!